A brief stop along the way. No more people for today but a whimsical play with colors. What can be more color-ful! Yep, very funny...Not that I am relaxing with my posting, it is just that I am exploring new stuff and it doesn't allow for more. If not take a look at the time I publish this. This box brings back memories about my childhood days a long, long time ago. Of course we could talk about quality, about brands, about drawings we made or just the nice smell but I leave it all up to your imagination. 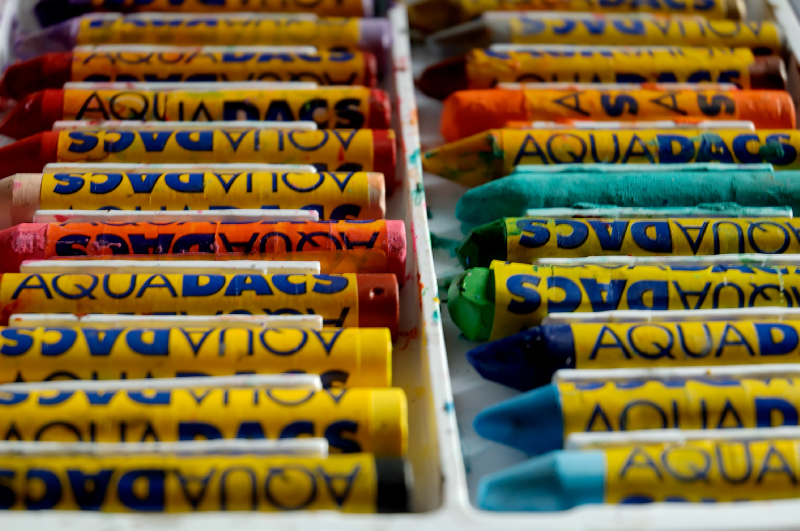 Paintboxes, colour crayons, pastels, colourful yarns, all make me dream. I dream of all the magnificent things I will draw, sew, create, it's a very wonderful sensation. Pity very little of it actually comes out to the world. Ah, yes, the colors of childhood. The joy of discovering absolutely everything, the sorrow of being made to take naps when you don't want to! i like the post a lot, great one for the weekend. I like both the colours and pattern effect. When I first looked at this photo I thought that it was a promotion of an adverising company! Your post wakes up many memories. Happened to chance upon your page and it's great! I enjoy all your photos and I certainly do hope to visit Barcelona again...Gaudi the great.. Excellent post with the detail, close-up and colours. Bravo amigo. Carlos, interesting that you mentioned the smell of crayon and I instantly remember...yes, the smell is part of the memory as well :-) nice photo! I know they are only crayons, but what a wonderful picture they make. Some other great shot son the site this week too Carlos! Like this style too Carlos, it's not all about architecture, so good experimenting !